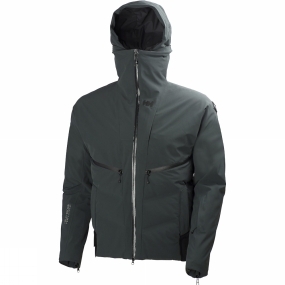 The Men's Ted Jacket from Helly Hansen is a sleek and fast alpine design in a shorter cut. With emphasized zip detailing, and classic racing lines, this jacket makes a bold statement backed by modern technology, and ground breaking design. It also features highly breathable and waterproof Helly Tech Professional fabric, and premium PrimaLoft Silver Insulation to keep you warm. The soft interior is equiped with highly innovative H2Flow system for turbocharged mechanical venting to regulate temperature.